All Green Pest Control, a locally owned Pest Control Company, has provided fast reliable service to Pierce County and South King County residents and businesses for over 12 years. All Green Pest Control uses “greener” or less toxic pest control products as well as non-chemical control techniques while still maintaining excellent control of the target pest. We give FREE estimates for both residential and commercial pest services. All Green Pest Control provides an accurate assessment of pest problems and then offers the customer a solution to minimize the use of pesticides. 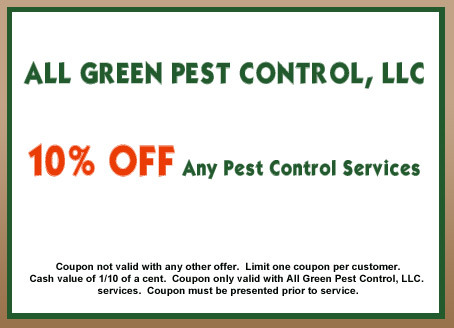 Contact All Green Pest Control for all your pest control needs! All Green Pest Control was extremely adept, expert, and high-skilled at tracking down the mysterious odor that was escaping from our crawl space. Also, arriving at the appointed time was significant in our book because too many companies don't. Our call was returned immediately after our frantic SOS. Dave showed up and quickly found the pesky rodent hiding in our garage, baited the traps and reviewed what we needed to look for to avoid future "friends." I don't think he had made it out of our neighborhood before that rat was caught. Outstanding service. When he wasn't able to successfully solve my problem, he returned my payment, no questions asked. Would highly recommend him. Wonderful service. Dave got rid of a nest of yellow jackets quickly and efficiently. Have added this company to my contact list. Highly recommend.